Emily Bronte (1818 - 1848) is best known for her widely read novel, Wuthering Heights (1847). She also wrote poetry, though these works are lesser known than her prose. 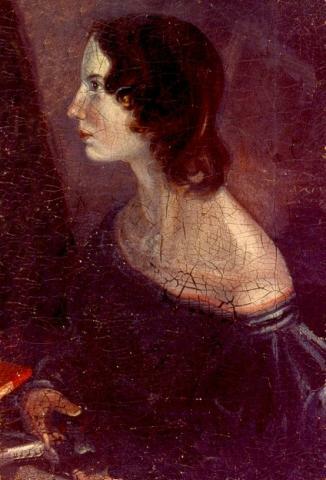 Emily was the fifth of six children, younger sister of Charlotte Bronte, the most famous of the Bronte children. Emily's mother died when she was just three years old. Her father withdrew the Bronte children from school, and soon thereafter, her sister Elizabeth died. Their father was strict, insisting the children stay absolutely quiet in one room during the day while he worked in his office. The girls used to create a number of fantasy worlds, which they wrote about in their owns stories and enacted imaginary adventures. Her sister Charlotte Bronte taught at the Roe Head girls' school, where Emily attended, but she went home after growing homesick. The girls decided they were going to start a school of their own, but it was never successful. Emily became a teacher at the Law Hill School in Halifax in 1838, afterwhich she moved to Brussels in 1842, where she perfected her German and French. Emily assembled her own collection of poems in 1844, which her sister Charlotte discovered and encouraged their publication. Emily didn't like having her privacy invaded, but eventually agreed to a collection jointly published by all three sisters, titled Poems , published in 1846 using their male pen manes: Currer, Ellis, and Acton Bell. In 1847, Emily published her novel, Wuthering Heights, as the first two volumes of a three-volume set. The third volume was published by her sister Anne, titled Agnes Grey . Wuthering Heights eventually became an English literary classic, but initially was met with mixed reviews for its portrayal of amoral passion. Emily died young, most likely consistent with her family's medical history of early death due to polluted water they drank growing up. She got sick after her brother's funeral in 1848, dying the same year. Charlotte edited and published Emily's novel as a stand-alone work in 1850. Emily was working on a second novel, but her manuscript was never found.